Spike Spiegel of Cowboy Bebop. Benny from Black Lagoon. Jesus of Saint Young Men. These anime characters are popular, but could they have something else in common? When Jewish anime fans search for representation in their favorite medium, they find it between the lines if they do at all. And yet, Judaism is one of the world’s most well-known religions. Why is it so underrepresented in anime? Very few characters in anime (or other pieces of Japanese media) are explicitly stated to be ethnically Jewish and even fewer are depicted practicing Judaism. In no way is this piece meant to be an exhaustive list of all Jewish and Jewish-coded characters in anime, manga, and other forms of Japanese media. Instead, it will examine the way that some of these characters are portrayed in selected works. Historically, due to Japan’s isolationist politics, there haven’t been many interactions between Japanese and Jewish populations. The lack of familiarity of Japanese people with the Jewish diaspora is one of the primary reasons why even in works set in countries with prominent Jewish populations, such as the USA and Britain, there are seldom any Jewish characters. There are several reasons members of the diaspora are in Japan today. First, they may be descendants of two small waves of migration. The first wave of emigration took place in the 19th century and consisted of Jewish traders who traveled and settled in Japan for business-related purposes. The second wave was composed of refugees who fled to Japan during World War II, with the help of visas written by Chiune Sugihara. Second, they might be members of the diaspora who emigrated to Japan later, for various reasons. In addition to the small ethnic Jewish population, there are also some Japanese converts to Judaism, though their number is also very small. Said lack of prominence of the Jewish diaspora in Japanese society leads us to one of the key factors that influence the portrayal of Jewish people in anime: American media. Due to its prominence in Japan (mainly in the form of Hollywood films), it plays the biggest role in “carrying over” the concept of Jews as people across the Pacific. To put it concisely: a positive portrayal of Jewish people in Hollywood films results in people in other countries, such as Japan, having a positive perception of the diaspora. This also applies vice versa, with antisemitic stereotypes resulting in a negative perception of the diaspora. However, while American media does have a strong influence on the perception of Jewish people, it can’t be used as an excuse to shift the blame of some creators (such as Recovery of an MMO Junkie’s Kazuyoshi Yaginuma) for their antisemitic views. Furthermore, the influence of Imperial Japan’s ties with Nazi Germany and the prevailing xenophobic sentiments in the country also shouldn’t be discounted as a factor in the foundation of such views. Proportionally, the largest chunk of Jewish characters in anime consists of characters based on historical figures who were Jewish in real life. Some of the more prominent characters belonging to this category are Fritz Lang in Fullmetal Alchemist: Conqueror of Shamballa and Jesus from Saint Young Men. The Jewish backgrounds of characters in this category are rarely explored, as the emphasis is generally put on the actions of historical figures, rather than factors that influenced them. For this reason, Jewish characters in adaptations of preexisting works can also be lumped into the aforementioned category. However, this results in a fortunate side effect of many elements of antisemitism of the original work getting cut during the adaptation process. The result is characters that, while not explicitly portrayed as Jewish, also lack the original’s negative traits. The Conqueror of Shamballa is a fascinating example to dissect on its own due to its setting: Nazi Germany. Germany under the Third Reich is one of the few settings in media in which Jewish identity tends to be brought to the foreground. Curiously, this trend doesn’t apply to Conqueror of Shamballa. The film leaves it ambiguous whether Lang is prosecuted because of his films or his Jewish background. Furthermore, the emphasis that the film’s narrative puts onto Lang’s films strongly hints that, within the film’s universe, it’s the former rather than the latter. The film also opens a peculiar can of worms by having a Jewish character in one universe (Fritz Lang) be the fantastical equivalent of Hitler (Fuhrer King Bradley) in another. In a sharp contrast to said stumble, the film explicitly condemns Nazism as an ideology and features a sympathetic Romani character. This contrast suggests good intentions on the part of the film’s creators. In turn, this makes it easy to attribute the stumble to the lack of knowledge on their part, rather than malicious intent. Interestingly, none of these missteps are present in the manga that inspired the 2003 loose adaptation of the story; nor are they present in the manga’s later adaptation, Fullmetal Alchemist: Brotherhood. The other, much smaller portion of Jewish characters in anime consists of fictional characters who are directly stated (or shown) to be Jewish. 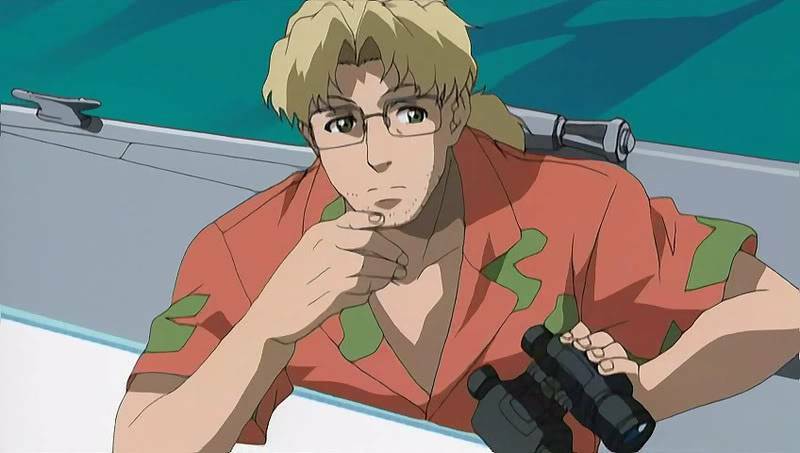 The most prominent such character is Benny, one of the protagonists of Black Lagoon. Before dissecting the portrayal of Benny, it should be acknowledged that neither the manga nor its anime adaptation offers the most progressive representation of women. Women in Black Lagoon, while possessing a sense of agency, also tend to be sexualized to a great degree. Notwithstanding the work’s missteps in its portrayals of women, its portrayal of Benny is very respectful. Benny doesn’t display any antisemitic stereotypes before or after the confirmation that he’s Jewish. Despite frequently playing the role of comic relief, he isn’t used as a source of antisemitic jokes; rather, the fact that he’s originally from Florida is. Benny first states that he’s Jewish in an arc where the protagonists confront Neo-Nazis—making the only caveat in his portrayal the fact that it’s strongly tied to Nazism and the Holocaust, and isn’t explored outside of these topics. Although the arc is from a manga that originally started running in 2002, it is refreshing to consume in today’s political climate. Particularly, this stems from its willingness to confront and condemn Nazism as an ideology—an aspect that unfortunately is rarely found in other anime featuring Nazis. On the other hand, while Benny is a rounded Jewish character, he isn’t a morally good one. Like other protagonists of Black Lagoon, Benny takes part in many dubious actions. What’s “nice” about Benny’s moral compass is that Black Lagoon doesn’t tie it into the antisemitic notion of Jewish greed. As seen with Benny, it’s rare for anime featuring Jewish characters to spend much time exploring that aspect of their identity. Though this is expected for minor characters, it becomes noticeable when the character in question is a protagonist or even a prominent secondary character. Up to this day, the only prominent work that both features Jewish identity and explores it is the Osamu Tezuka’s manga Message to Adolf (originally published from 1983 to 1985). Revolving around a trio of men named Adolf (one is Jewish, one is German, and one is Adolf Hitler himself) and spanning from the Berlin Olympics to the ‘80s, the manga not only features Jewish characters but also explores many Jewish themes and issues. The main focus of Message to Adolf is the world’s relationship with the rumor that Adolf Hitler had Jewish ancestry. Along with it, the manga explores the myth of a self-genocide (i.e., Jewish people being the cause and the executor of their own prosecution) that spurned from it. Despite the manga’s nuanced portrayal of Jewish identity, it still contains some unfortunate tropes associated with Jewish-focused stories. One such trope being sympathetic and/or oblivious Nazis. It also features a character who fits the “Greedy Jew” archetype, though I’d argue this is balanced by many other positively portrayed characters. Along with exploring the aforementioned rumor, the manga also touches on many other issues that don’t tend to appear outside of Jewish works, particularly the nuances and fragility of the Jewish/Gentile friendship exemplified by two of the Adolfs. Aside from the above few examples, most “Jewish” characters in anime are only accidentally coded as such, rather than purposefully designed to be Jewish. Jewish-coding is the act of using a variety of indicators to hint that a given character might be Jewish, without explicitly stating said character’s ethnicity or religious identity. There are a variety of ways to “Jewish-code” a character: a surname, the character’s actor being Jewish themselves, stereotypical behavior, physical traits, and many more. The historical origins of Jewish-coding in Hollywood films (where the practice originated) are quite harmless. It was simply a way for Jewish creators to insert self-referential commentary into their works in a largely antisemitic environment. The slight “problem” occurs when these tropes also leak into Japanese media. Without the explanation of the ethnic group behind this coding, a Japanese creator may accidentally see these tropes as part of a general Western character archetype, rather than specifically a Jewish one. A famous example of one accidentally Jewish-coded character is Spike Spiegel from Cowboy Bebop. Many of the character’s attributes are reminiscent of ones typically used in Western media to Jewish-code a character. Spike’s surname, Spiegel, is a typically Jewish one. His very frizzy dark hair is also a physical trait associated with the Jewish diaspora. Spike also carries an Israeli-made firearm. The last trait is a prominent way of coding characters as Jewish in military and gangster genres. It can also be argued that his character arc furthers this impression, as it possesses many Jewish themes, such as the nonchalant way in which Spike approaches death during the series. When asked about the character’s Jewish traits, the creators allegedly responded along the lines that they chose the surname because it looked cool. Additionally, the “Spike” special on the Cowboy Bebop movie notes that Spike’s physical appearance was based on the actor Yusaku Matsuda. Though the creators’ reaction is understandable—as it wasn’t their intention to create a Jewish character—it stands out from a series that otherwise meticulously researched the cultures that it borrowed from. The response also poses questions related to the Death of the Author theory: namely, whether such a character can still be seen as Jewish and thus whether his portrayal should be judged as such. On a more positive note, it should be noted that most Jewish characters in anime—whether they are directly stated to be Jewish or are simply coded as such—are examples of either neutral or even positive portrayal of Jewish people. Unfortunately, there are some standout examples of negative Jewish representation. The most infamous example is the 1989 OVA Angel Cop. The six-episode production portrays Jewish people (replaced by generic “American” stereotypes in the dub) as being in charge of a conspiracy planning to take over Japan. The OVA frequently employs the stereotype of Jewish bankers to further the idea that they are “evil” to the viewer. This negative portrayal can be directly linked to the prominence of conspiracy theories in the vein of “Jews secretly run the world” in Western media. And while this OVA has thankfully been mostly forgotten, it is an “exemplary” reminder of the reach that bigoted views can have, when given the chance to spread. Although Jewish characters have a limited presence in anime and manga, some currently occurring changes suggest that the medium might become a reasonable source to look for well-rounded Jewish characters. There is the possibility of the aforementioned Tezuka’s manga being adapted into an anime, following the recent trend of Tezuka’s works receiving remakes and new adaptations. Additionally, the increase of Japanese/Western co-productions might result in the inclusion of more Jewish characters. The prominence of Jewish characters and characters from other historically oppressed groups might also increase as Japan slowly acknowledges its own and its ally’s (Germany’s) history and crimes during World War II. Personally, I think this possibility is a good thing. As well as providing representation to Jewish anime fans, it increases the number of stories that can be told. The greater visibility of the Jewish diaspora arguably also facilitates cross-cultural interactions, with informed portrayals of Jewish people, providing a base for it. As somebody who is part Jewish and who is not originally from the West, I find the idea of stories about or simply featuring Jewish people, told from a non-Western perspective, very promising. Originally from Russia, Stas Livre is a writer and an artist. They currently have a very limited online presence. At present they are studying film studies in UK.